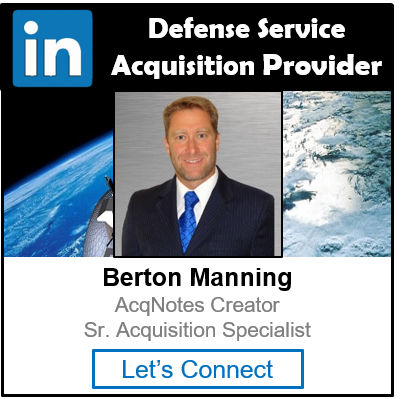 AcqNotes was founded by Berton Manning on the principle of providing the Aerospace community with an easy source of Department of Defense (DoD) acquisition related information, guides, templates, instructions, news, resources and community interaction. AcqNotes complements the tradition DoD acquisition resources by providing a place where people can learn the basic concepts of an acquisition related topic (Notes) before exploring these traditional resources for more detailed information. These traditional resources can be difficult to find and understand due to the large amount of information they provide and the wide variety of resources available. AcqNotes simplifies this information into easily understandable topics so its users can gain a better understanding of the topics they desire and the resources available to them. Provide the Defense Service Acquisition Community a Knowledge and Intelligence Source to Better Meet the Demands of the DoD. Along with providing the Aerospace community with a simpler source of information, AcqNotes provides a platform where Professional Services companies can advertise their expertise to the Aerospace community. This expertise can range from engineering consulting services, technology and concept development, computer programs, test & evaluation, cost estimating and research and development and much more. AcqOps provides potential buyers and sellers a place to network and understand what services are available.